The Morgan Company history goes all the way back to 1910, and owes its success to producing highly distinctive cars that fit a niche market. Their early success rode on just three wheels, an extremely lightweight vehicle with its Vee-twin engine uniquely positioned right up front. The 4/4 model, meaning 4 cylinders and 4 wheels, was introduced in 1937, and was the genesis of their successful production right into the 1950’s and beyond. The evolution of the Morgan was a uniquely slow and respectful process, retaining throughout the distinctive, classic Morgan features that have always endeared the marque to enthusiasts. Features like the sliding pillar independent front suspension harken back to the first Morgan 3-wheelers, and Morgan’s classic body construction featuring lightweight panels over ash framing are an essential part of their hand-built tradition. But while the evolution was slow, Morgans did steadily evolve and this 1953 Plus 4 exemplifies the best of that progression. It was built in 1953 as a right-hand drive standard ‘Flat-rad’ drophead, documentation shows it was then returned to the factory in January 1954 for conversion to left-hand drive. Later that year it was again back at Morgan’s where it was updated to its present configuration with the ‘new pattern’ raised headlamp arrangement and a ’rounded stone guard’ radiator surround that was new for 1954. The factory also installed the notably superior cam gears steering at that time. 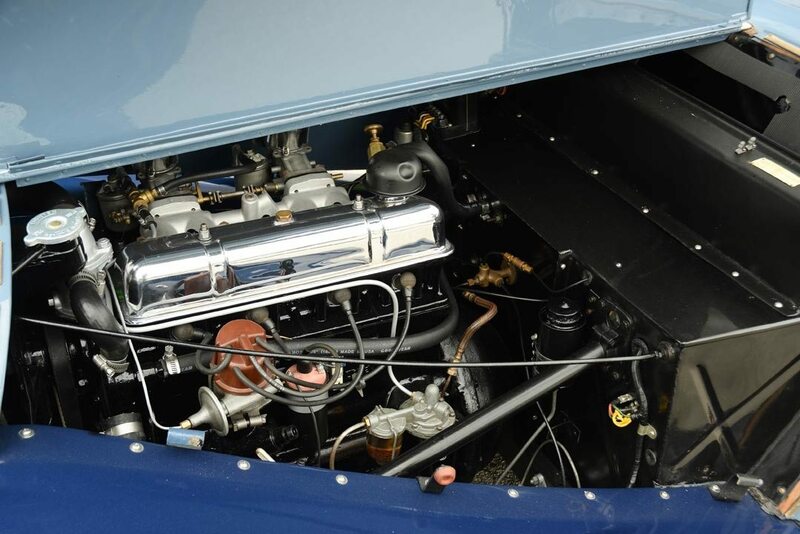 This lovely example utilizes the more powerful 2-liter Triumph engine that was available from Morgan starting in mid-1953, instead of the previous model’s Standard Vanguard unit. A top speed of 100MPH could now be easily achieved, and the Morgan remains clean and mechanically correct from the engine bay to the chassis. Finished in a medium blue on the body with dark blue fenders, the panel fitment and paint finish on this car is exceptional. From the trim to the chrome and even the fine wood dash and instruments, the details of this restoration are impeccable. 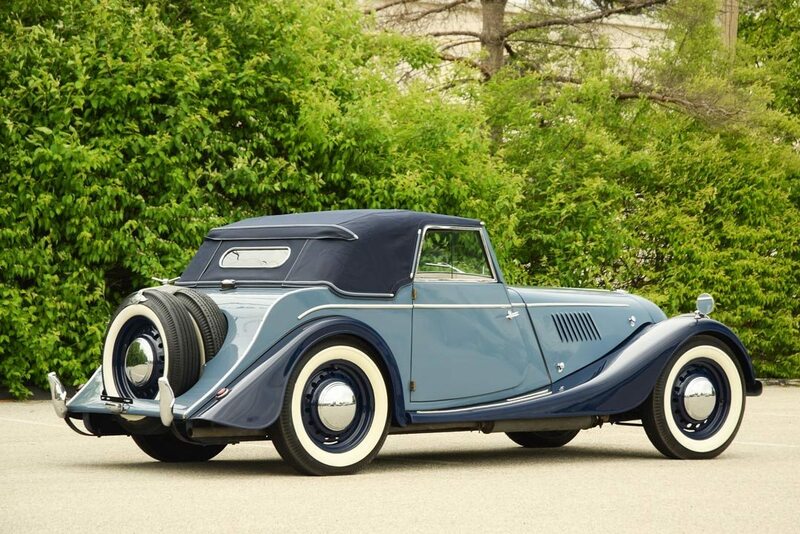 The medium blue leather interior and a dark blue cloth convertible top are both excellent, and this rare left-hand drive Morgan Plus 4 is one of the most luxurious and expensive three position drophead coupe models you’ll ever see. It features painted steel wheels with the correct chrome hubcaps, and fresh Firestone whitewall tires. 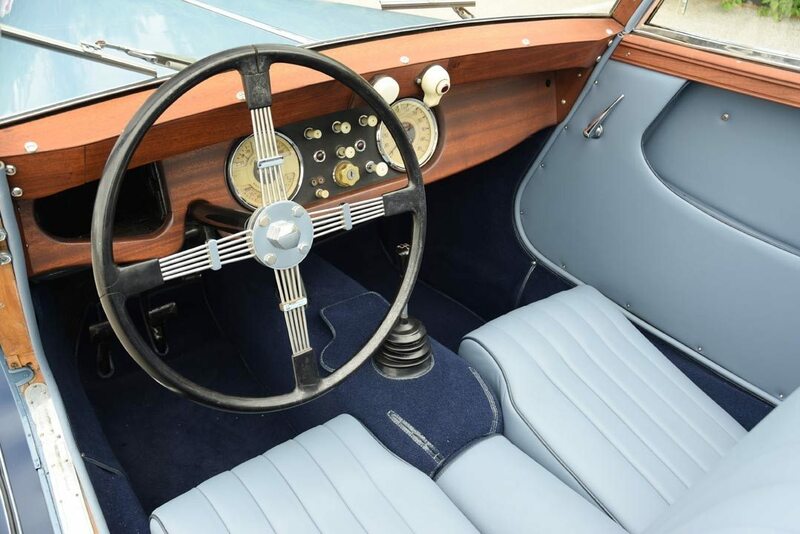 Traditional styling cues include dual rear-mounted spare wheels, fender-mounted wing mirrors, fixed sliding glass windows and a lovely Brooklands steering wheel. 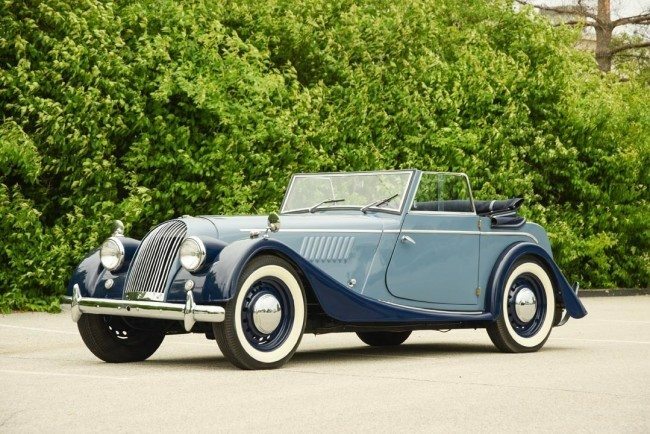 It was originally sold and serviced by Fergus Motors, a New York City import dealership that was one of the first Morgan agencies in the United States. It has since received a ground up nut and bolt restoration and presents today in superb condition from top to bottom, inside and out. It beautifully shows off the best features of Morgan’s continuous development in a classic British package. If you have an early model Morgan motor car or another collectible you’d like to insure with us, let us show you how we are more than just another collector vehicle insurance company. We want to protect your passion! Click below for an online quote, or give us a call at 800.678.5173.